There is nothing more embarrassing than failing to parallel park on a crowded street in the summer, when pedestrians stop to laugh and point while other drivers scorn you for taking up the road. Fear not, for those days are nearly behind us! Groundbreaking developments in car sensor technology has allowed manufacturers to offer Automatic Parallel Parking as a feature in a handful of newer model vehicles. However, like any other computerized mechanism, it will only work if you know how to use it. Press the "Parallel Park" button. Find a parking space and pull forward until the system notifies you that it has found a spot. Shift into reverse, then release the brake and steering wheel. 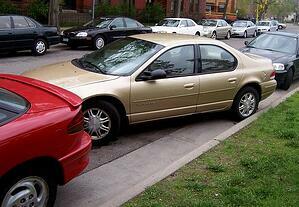 Auto parallel park takes over, telling you when to shift into drive, accelerate or brake. The 4th point is important to note. The system does not do everything for you, and will notify you audibly when it wants you to do things like pull in front of a space, shift into reverse, take hands off the wheel, accelerate or brake. You can also override the system at any time by grabbing the wheel or braking. Different manufacturers and even different models have varying versions of this system. Check the owner's manual for exact instructions on your vehicle's functions. Most models do not have Automatic Parallel Parking as a base feature, and would require you to upgrade in order to have it installed. For example, the 2019 BMW 7 Series offers a Parking Assistance Package for an additional premium that steers your car into a parallel space while you control the accelerator, brake and gear shift. Miraculously, this same model also comes with the option of Remote Control Parking via your key fob, for an additional premium. Some models also offer perpendicular parking assistance, such as the 2018 Volkswagon Golf SportWagen. Others offer Automatic Parallel Parking as part of an entire comprehensive technology package, such as the 2019 Ford F-150. According to U.S. News, the most cost-efficient method of attaining parallel parking capabilities in this model is to purchase the Lariat trim, Technology package and 502A Equipment Group. All of this costs a pretty penny extra, but will include the functions of hands-free parallel parking, forward collision warning, automatic emergency braking, pedestrian detection, automatic high beams & a rear-view camera with hitch assist. For more information on Automatic Parallel Parking, visit the link below. And, as always, stay safe & buckle up!